In association with India’s TVS Motors, BMW has developed a new concept G310. 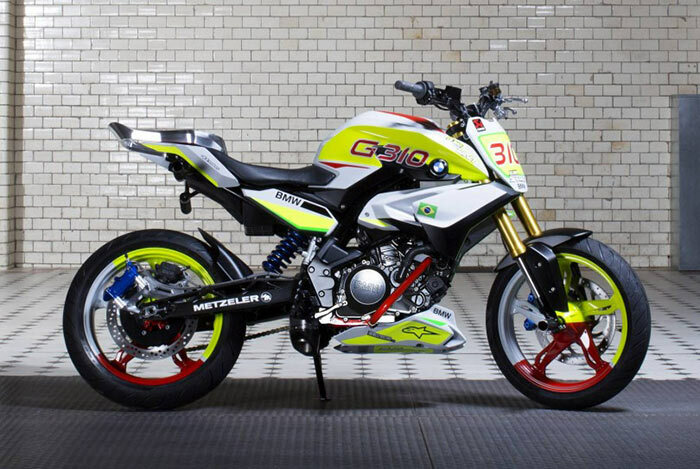 Hearing straight from BMW, the concept G 310 an interpretation of aggressive and agile stunt motorcycle which is based on a one cylinder study. The company has revealed details about this at the Salao Duas Rodas which is the largest motorcycle show in Latin America. The motorcycle has been designed and developed using extensive inputs from 4 times World and European stunt riding champion, Chris Pfeiffer, the naked G 310 Concept is made for stunt riding. As the bike has been first unveiled in Brazil, the color of the concept bike is inspired by Brazil’s national flag. Speaking about the exhaust note, BMW says that The sound of the BMW Concept Stunt G 310 is attractive and attention seeking. The exhaust of BMW TVS concept is located behind the engine, in a vertically downward position. This has been done so as to give complete freedom to the rider while stunt riding. The concept bike looks very similar to KTM Duke, TVS 300 cc motorcycle would be aimed at segment where the KTM Duke is not being offered yet. Although BMW did not reveal engine specs on board the new concept, we can expect 310 cc single cylinder capable enough to generate around 35-40 PS. Based on the G 310 concept’s K03 platform, BMW has confirmed that there will be a range of motorcycle on offer. These will include fully faired bikes, naked bikes, as well as adventure tourers.